With its debut in 2012, CX-5 paved way for Mazdas KODO – Soul of Motion design and SKYACTIVE Technology. Since then, the CX-5 has continuously developed and improved which included an ALL-NEW design in 2017 which saw the Mazda CX-5 firmly cemented as Australias #1 selling SUV. With 3 updates in 2018 alone, this crowd favourite pushes forward ahead of the competition, making it A CUT ABOVE. What Drives the CX-5 Success? From young couples to retirees, customers across a range of demographics and needs flock to the CX-5 as a preferred vehicle. The combination of a raised seating position, KODO design and high level of equipment in a versatile yet compact vehicle are the true sellers. So why choose the CX-5 over other brands or models? So why choose the H Model CX-5? Continuing to amaze, the CX-5 is beautiful on the outside and even more so within. Full of technology, comfort and convenience. Offering Mazda Service Select, 5-year Manufacturer Warranty and leading customer experience, why would you consider anything else? What’s new with the H Model CX-5? To kick off, Mazda has provided something to be excited about, the SKYACTIVE-G 2.5L Turbo Petrol engine available on GT and Akera. This will boast a 170kw and a huge 420Nm power output for those wanting something with a bit more “KICK”. Add i-ACTIVE AWD, GVC Plus and Sports mode, its perfect for those who enjoy a premium experience that a high-end drivetrain offers. Additional changes include major styling refinements, improvements to ride, handling, comfort, Apply Carplay/Android Auto and NVH as well as the introduction of a suite of i-ACTIVSENSE safety features. With 14 variants, 8 colours and around 540 accessories, we can build a CX-5 package that really talks to you as the customers. 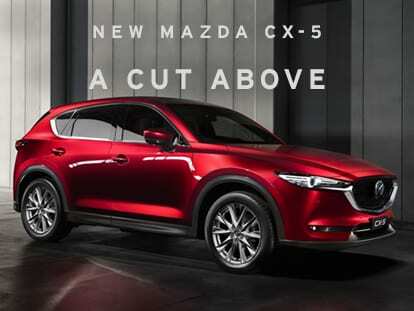 The ALL-NEW CX-5 is available at Berwick Mazda. Complete a Test Drive form on the right to Test drive yours today! For more information, contact us on 03 8796 6222 or visit our dealership at 3 Prestige Place, Narre Warren 3805 (2 minutes from Fountain Gate, Bunjil Place and Monash Fwy).